Veteran Zambian politician and opposition leader Michael Sata has won the presidential election, with 43 percent of the vote compared to Rupiah Banda’s 36 percent. 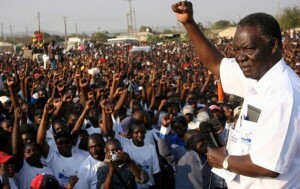 The nationalist Sata, 74, was declared Zambia’s next President on Friday, after a tense election. Sata, who leads the Patriotic Front (PF), garnered 1,150,045 of votes cast, and Banda had 961,796 votes. Banda’s Movement for Multiparty Democracy (MMD) has been in power since 2001 when one-party rule was ended after its founder President Fredrick Chiluba beat Kenneth Kaunda. There are unconfirmed reports that Banda’s MMD was bankrolled by the Chinese government while Sata, a long time admirer of Robert Mugabe, got financial backing from ZANU PF. Political analyst Blessing Vava told SW Radio Africa Sata’s victory shows that perseverance pays in politics, as he had spent 20 years in opposition politics. During this period Sata, nicknamed ‘King cobra’, lost three presidential elections. ‘Sata has been a popular politician for the last ten years and was bound to win the election. We must also commend the outgoing president as he has shown the world that he’s a democrat, he’s a leader that accepted defeat and has respected the will of the people. ‘This should work as a wake up call for people like Robert Mugabe that in the event he loses the next election he should respect the result of the poll,’ Vava said. The former student leader said lessons that should be drawn from the Zambian election are that leaders are not indispensable. ‘Once people are tired of you, they’ll vote you out. These leaders must not take people for granted as we have witnessed on countless occasions. It will reach a point where the electorate will punish you through the ballot box,’ Vava added.